Trained therapists use advanced technology to provide patients with the fastest and most complete road to recovery. Specialized physical, occupational and speech therapies are administered according to the instructions of your doctor. In addition, an extended care physical therapy program is available to help you develop an independent program. The Shore Center for Outpatient Rehabilitation is located on the first floor at 710 Centre Street in Somers Point, across from Shore Medical Center. Open Monday through Friday. Close, convenient and free parking is available just a short distance from the Center's front door. To learn more, call 609-653-4677. Shore Medical Center's Cardiac and Pulmonary Rehabilitation Center provides comprehensive services for patients diagnosed with cardiovascular and pulmonary diseases. To learn more, click here. Shore Medical Center’s Outpatient Rehabilitation Center recently became approved to provide Supervised Exercise Therapy for Peripheral Artery Disease (PAD) patients. Chris Kozmor, RN, director of cardiopulmonary rehabilitation, and her team of exercise physiologists, work with PAD patients to develop a customized exercise program. Exercise consists primarily of walking on a treadmill. The treadmill speed and grade of the incline is determined during an evaluation at the initial exercise session. Most patients begin at a 2-mph speed. Patients are asked to walk to a mild to moderate pain level, stop and sit down and rest until the pain goes away, and then resume walking. During the course of the treatment, patients gradually build from walking a total of 15 minutes a session up to 60 minutes. 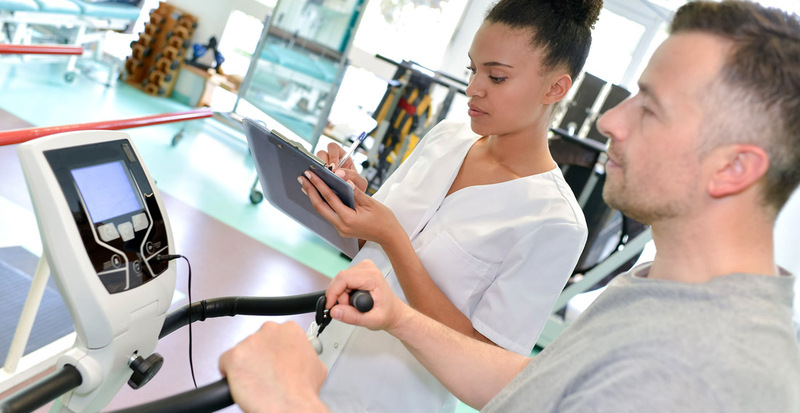 Shore’s exercise physiologists are trained to care for patients with a wide range of medical conditions and histories. To qualify for the PAD supervised exercise therapy program at Shore, you only need a positive PAD test result and referral from your physician. When patients make the amazing transformation from wheelchair to walker to crutches to treadmill, hours of challenging physical therapy precede each difficult step. Shore Medical Center patients experience incredible recoveries every day. Physical therapy can help patients restore range of motion, confidence and quality of life from conditions such as stroke, repetitive motion injury, arthritis, back pain, surgery and more. The advanced training of Shore's licensed therapists is complemented by some of the best tools in the industry, including cutting-edge electrical stimulation devices and the latest isokinetic and Nautilus-style exercise machines. Physical manipulation allows therapists to mobilize joint capsules to regain accessory motion and increase range. Whirlpools and other hydrotherapies are often used to improve circulation. Relieving patient pain is the top priority. Once a patient's pain is under control, therapists can concentrate on stretching and strengthening the injured area. Finally, therapists work to improve a patient's overall fitness level often through aerobic exercise. Detailed exercise recommendations are also provided to help the recovery continue at home. For patients who have completed their physical therapy treatments, but are not quite ready to join a fitness center, the department also offers a self-pay extended conditioning program. To learn more about physical therapy and whether you could benefit, talk with your physician or call the Shore Medical Center Physical Therapy Department at 609-653-3512. Speech therapy is offered to Shore Medical Center inpatients and outpatients. Licensed speech therapists are available seven days per week to diagnose and treat speech disorders. Specialized modified barium swallows are performed to diagnose swallowing disorders and develop treatment plans. To schedule an outpatient modified barium swallow as prescribed by your physician, call 609-653-4600. To schedule an outpatient speech therapy appointment please call 609-653-4600. Shore Medical Center's Occupational Therapy program is provided by licensed therapists to help patients regain their independence in life skills, including dressing, feeding and routine home activities. In coordination with physical therapy, these highly skilled therapists work to maximize the patient's safe recovery. To learn more about occupational therapy visit www.Aota.org. The Balance Center at Shore Medical Center uses a series of sophisticated and painless tests to diagnose for balance or dizziness disorders. The testing process takes slightly more than an hour and offers patients complete diagnostics and vestibular (balance) therapy treatment, giving them confidence to get back on their feet. The Balance Center is designed for anyone with dizziness, vertigo, difficulty judging distance, people with an increased risk of falling and anyone who has fallen once in the past year. Approximately 90 million Americans suffer from dizziness. If you or someone you know experiences dizziness or difficulty balancing, ask your doctor to schedule a balance test at Shore Medical Center. For more information, call (609) 653-3512. Shore physical therapists are specially trained in vestibular rehabilitation therapy (VRT), an exercise-based program designed to promote central nervous system compensation for inner ear deficits. VRT can help with a variety of vestibular problems, including Benign Paroxysmal Positional Vertigo (BPPV) and the reduced inner ear function on one or both sides associated with Meniere’s Disease, Labyrinthitis and Vestibular Neuritis. Even individuals with long-term, unresolved inner ear disorders may benefit. VRT can also help people with acute or abrupt loss of vestibular function following surgery for vestibular problems. Think you have a Balance Problem? Take our quiz* to find out if you are a good candidate for testing or treatment. When you are dizzy do you feel a spinning sensation? Do sudden changes in position such as bending over, looking up or rolling over in bed provoke your symptoms or make them worse? When you are dizzy do you experience pain or pressure in your ears? Is your hearing significantly worse in one ear? Do you have double or blurred vision? Do you have increased sensitivity to light or sound? Do you experience headaches or migraines when dizzy? Do you experience ringing, buzzing or other sounds in your ears? If you answered yes to one or more questions, ask your doctor about testing at the Balance Center at Shore Medical Center. For more information call (609) 653-3512. * Quiz information is provided courtesy of Continuing Care, the Balance Center and Shore Medical Center’s partner in balance testing. Jennifer has served as the Director of Rehabilitation Services for the past 10 years. She is a graduate of Richard Stockton College with over 20 years of experience. Jennifer's clinical background is in Sports Medicine and Orthopedics, including a specialization in shoulder treatments, vertigo, balance and return to play. Her professional interests include adolescent sports medicine and orthopedic treatments. Jennifer has been a team member at the Advanced Spine and Orthopedic Institute since 1997. Sheree is a graduate of Atlantic Cape Community College. Sheree's clinical background is in acute care and outpatient therapies with over 15 years of experience. Her professional interests include major joint replacement, surgical spine, spine injury, stroke and sports medicine treatments. Sheree has been a team member at the Advanced Spine and Orthopedic Institute since 2004. Erin is a graduate of Boston University with over 10 years of experience. Erin's clinical background is in neurological, pediatric and early intervention treatments. Her professional interests include neurological, sports medicine and orthopedic treatments. Erin has been a team member at the Advanced Spine and Orthopedic Institute since 2012, coming from Massachusetts General Hospital and Howard Head Sport Medicine of Vail, CO.
Misty is a graduate of East Stroudsburg University and received her Master’s Degree from the College of St. Rose. Her clinical background in acute care and she has over 18 years of experience. Misty specializes in post-stroke treatment. Her areas of expertise include aphasia and dysphagia. Misty has been a team member at the Advanced Spine and Orthopedic Institute since 2004. Ann LahrAnn specializes in occupational therapy, having obtained a Bachelors of Science in the field from Elizabethtown College in 1985. She joined the Advanced Spine & Orthopedic Institute’s physical therapy team in 1999. Her sub-specialties include acute care, neuro and orthopedic conditions, traumatic brain injury, splinting and adaptive equipment assessment.